The first Chromecast media-streaming dongle was released two years ago and the fans were anxiously waiting for a worthy successor. The wait is over, because Google found perfect timing to announce the Chromecast 2, alongside the Chromecast Audio, a music-streaming device which has an introductory price of $35. In this article, we’ll tell you everything you need to know about these two new gadgets. This digital media players costs also $35 and it’s plugged into a HDMI port, transforming an ordinary TV into a smartTV, but it requires a USB port or a mains outlet, for the power. The device is very small and resembles a memory stick, but with a bulge at the base. The first generation Chromecast was 72 mm long, 35 mm wide and had a thickness of 12 mm, while it weighted 34 grams. Under the hood was placed a Marvell Armada 1500-mini 88DE3005 chip which was powered by an ARM Cortex-A9 processor clocked at 1.2GHz, which was backed by 512 MB of Micron DDR3L RAM. The internal memory had a low capacity of only 2GB, but without the option to upgrade it and the streamer utilized 2.4 GHz 802.11 b/g/n access points. There isn’t much to say about this tiny object, in addition to the fact that the model number is MST3K-US. 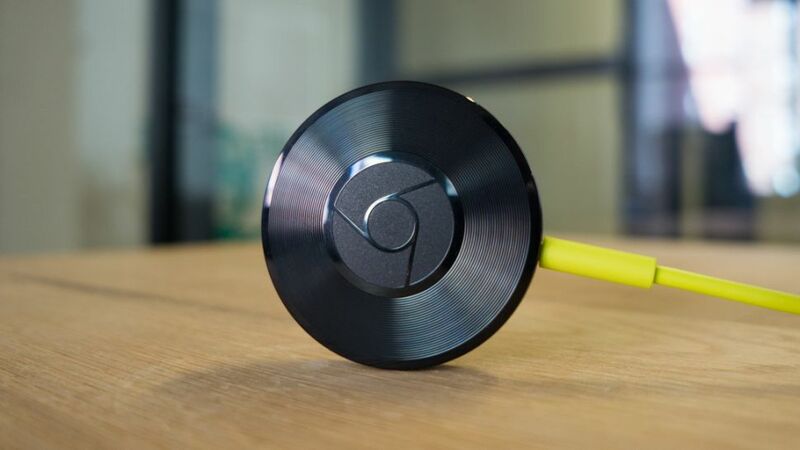 The second generation Chromecast still plugs directly into the TV’s HDMI port and it can be used for streaming video from a phone, tablet or computer, but it has a new design: a more circular body which is available in three colors: yellow, black and red. On top was emblazoned the Chrome logo, while on the bottom edge was placed a port which connects to a micro-USB cable. The Chromecast 2 has also a reset button and a magnetic back which allows the device to be attached to the side of the TV. The dimensions of the successor are 51.9 x 51.9 x 13.49mm and it’s powered by a dual-core ARM Cortex-A7 processor which is 2.5 faster than the previous CPU, and it’s paired with a Marvell Avastar 88W8887 wireless chip, and the wireless connection is much faster with 802.11ac WiFi. The new Chromecast doesn’t have its own interface and it takes content from the phone/tablet/computer and if you don’t put it to work, it will display only images. It has a redesigned Cast button which looks like a WiFi symbol (it’s rectangle and has broadcasting bars). Unfortunately, the ChromeCast 2 doesn’t support 4K content, only at full HD resolution, but the gaming experience is better and it depends on the phone’s performance. The Fast Play feature has been improved as well, being capable to reduce load time by up to 80 percent. It studies your behavior, and based on your previous actions, it will predict what you want to do next, so it will begin loading up, the next episode of a TV series you’re watching. This dongle has the same price as the new Chromecast 2, but it was created especially for streaming audio, being plugged into a speaker, using an AUX cable, instead of being plugged into a TV. It has two ports: the 3.5mm audio jack (working with 3.5mm-to-3.5mm audio cable, or a 3.5mm-to-RCA cord and even an optical audio output) and the micro-USB for power. It contains a Marvell Armada 88DE3006 1500 Mini Plus dual-core ARM Cortex-A7 processor, which is backed by Nanya NT5CC128M16IP-DI/EKDDR3L 2GB SDRAM and the flash memory is Toshiba TC58NVG1S3H 2 GB. You will just plug the 3.5mm jack into your speakers using the cable that is included in the box, and the micro-USB cord will be plugged into the power adapter. When the Chromecast Audio receives power, the LED status indicator will light up and when the color will turn to orange, it means that the device has some trouble connecting. However, in case the device doesn’t run properly, you’ll press the hard reset button. After setting up the Chromecast Audio, download the Chromecast app to your mobile device that runs on Android or iOS, and make sure that the dongle is connected to a WiFi network. If the device isn’t set up yet, you will need to configure it, but the application will do the entire job: it will test the speakers and if you hear a tone, it means that the device is working properly. Then, you will need to select a name for the Chromecast and you will be required to connect to an available WiFi network. In the end, you’ll install Chromecast-compatible applications on your mobile device and start streaming music to your speakers. Some of the applications that should run perfectly on your smartphone are Spotify, Google Play Music, Rdio etc.